Paddleton (film, 2019). A 2019 American comedy-drama film by Netflix. Directed by Alex Lehmann. Official Trailer. Paddleton is a 2019 American comedy-drama film directed by Alex Lehmann. 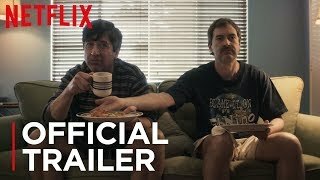 Paddleton | Official Trailer | Netflix. Middle-aged Michael (Mark Duplass) receives a diagnosis of terminal stomach cancer and plans to get medication to end his life. This upsets his older neighbor Andy (Ray Romano), as they are each other's best (and only) friend and escape from their menial jobs. Andy encourages Michael to try to fight the cancer, but Michael refuses to prolong any suffering. As per Michael's wishes, the two make pizzas together, watch kung-fu movies and play Paddleton, a game the two made up together. Andy promises to finally tell him a rousing halftime speech that he has been working on in secret. Andy is reluctant to help Michael end his own life, but agrees to join him on a road trip to the closest pharmacy that will fill the prescription, which is six hours away, discussing wishes and visiting an ostrich farm on the way. They pick up Michael's prescription and check into a hotel, where they are mistaken for a gay couple. The two go to a karaoke bar, where a nervous Andy finally delivers his halftime speech in the bathroom mirror before helping Michael perform a scene from their favorite kung-fu movie. The two later break hotel rules by using a jacuzzi after-hours while drinking. They are caught by the hotel owner, who ends up joining them and flirts with Andy, who becomes uncomfortable after she mentions her deceased husband, whom she believes is "all around her." Andy wakes up the next morning to find Michael gone with his medication (which Andy has kept in a drugstore safe) and panics, running all over the town to try to find him, only to discover him in the hotel lobby, waiting to meet up for breakfast. Andy tries to keep hold of the medication, until an annoyed Michael forces him to come to terms with the fact that he is dying, and that Andy needs to respect his wishes. The two drive back to Michael's apartment, where his condition quickly deteriorates. Michael reveals that he used to be married, but quickly felt uncomfortable in the marriage; however, he felt a sense of belonging with Andy as soon as they met. They discuss Andy's halftime speech (which Michael has already heard through the apartment's vents) and the possibility of an afterlife where Michael could haunt Andy. The film Paddleton was scheduled to be released by Netflix on February 1, 2019 (Sundance, Sundance Film Festival) and on February 22, 2019 (United States). Paddleton got high rating from critics. The audience also likes the film.